"Democratising the arts and the arts sector"
The European Association of Cultural Researchers (ERICarts Network) is committed, since 1993, to pioneering theoretical and applied cultural research as a recognized professional field and to promoting the exchange of scientific ideas and resources. Experts in 35 countries worldwide represent a broad range of academic disciplines. In 2004, the Association founded the ERICarts Institute to facilitate joint projects. All previous Associates of the ERICarts Institute agreed, at their meeting on 28 September 2017 in Brussels, to a retransfer of their company shares back to its founding organisation, the European Association of Cultural Researchers e.V. (ERICarts Network - former abbreviation: ECURES). The members of the ERICarts Board of Governors (BoG) took this step as a consequence of the necessary reorganisation of the Institute due to the planned changes in the governance of the "Compendium of Cultural Policies & Trends in Europe". The BoG members' formal approval of this transfer (under § 8.1 and 8.2 of the Statute) was also considered as a move towards securing the "European character" of ERICarts Institute. The Network Members' Assembly, held 8 November 2017 in Prague, thanked the former Associates (Boekmanstichting, CUPORE, OAC and ZfKf) for their support of the Institute and started a process to resume control. The new ERICarts Chair, Ana Villaroya (University of Barcelona), and Executive Director Andreas Wiesand were asked to develop perspectives for future joint activities, including research efforts involving Network members or the participation of the Institute in EU calls for tender. From early 1998 to December 2017, the Compendium of Cultural Policies & Trends in Europe (www.culturalpolicies.net) has been developed and run as a joint venture of the Council of Europe and the European Institute for Comparative Cultural Research (ERICarts), in collaboration with a dedicated community of independent national experts and specialists from over 40 governments in Europe. Kathrin Merkle (CoE) and Andreas Joh. Wiesand (ERICarts) acted as responsible editors during that period (the latter together with Danielle Cliche until 2009). Today the Compendium is recognised as the unique information and monitoring system in its domain; it served as a model for similar efforts in other continents (e.g. WorldCP). At the Compendium Assembly held 2015 in Wroclaw, the Board of the ERICarts Institute announced that it would, for practical and legal reasons (due to a dramatic decrease of public funding), not be able to continue its management of the project and that chances for a transfer of responsibilities into more hands should be studied. In 2016/17, a new Compendium "architecture" in the form of a membership association under Dutch law has been elaborated; the Council of Europe and ERICarts acted as Founding Members in October 2017, with specific rights regarding the legacy and integrity of the information system. Inter alia, the statute of the association opens the door for new actors (governments of Council of Europe member states, research bodies and universities, NGOs, foundations, etc. ), either as Stakeholders or Standing Members. As well, it recognises that Compendium authors should continue to work professionally (i.e. at "arm's length" from governments). In November 2017, a first Board of the Compendium Association was elected at the Prague Assembly; it includes the chair of the European Association of Cultural Researchers (ERICarts Network), Ana Villaroya. The Board subsequently selected Boekmanstichting (Amsterdam) as the new service provider for the day to day management of the Compendium. Cyprus: Compendium Stakeholders discuss elements of a "Roadmap"
The future Compendium "architecture" has been the main topic of Conference of Compendium Stakeholders on 30./31. March 2017 in Nicosia, hosted with great care by Cypriot authorities and the university. Compendium experts, including ECURES members, and government specialists set the agenda for the future of the information and monitoring system after 2017 (see Agenda) and formed a working group to facilitate the follow-up. Under the guidance of Marielle Hendriks (NL) and Joris Janssens (BE), this group later delivered a paper called "Towards a new Compendium of Cultural Policies and Trends: a Road Map". In connection with the annual "Compendium" event, the 11th Assembly of the European Association of Cultural Researchers (ECURES) has been held on Thursday, 12 November 2015 at the "Bar Barbara", HQ and information centre for "Wroclaw - European Capital of Culture 2016". Discussions focused on the future of the Compendium of Cultural Policies & Trends in Europe, run since 1998 in partnership between the Council of Europe and the ERICarts Institute. The Compendium is now entering a 'transitory phase' until 2017, heading towards either a multi-stakeholder governance construction or a more research-driven instrument, used and maintained mainly by universities with cultural policy courses. Members agreed to a more proactive role for ECURES, whatever status will finally be decided. They also reacted positively to plans to increase ECURES resources, possibly including membership fees, and elected a new Board. An initial workshop of the new UNESCO Expert Facility, composed of 43 specialists from around the world, was held on 18 / 19 May 2015 in Casablanca, Morocco, under the direction of Danielle Cliche. Other ECURES members taking part were Vesna Čopič, Raj Isar, Nina Obuljen and Andreas Wiesand. The main task of the group is to support, between 2015 and 2017, capacity development initiatives for the implementation of the 2005 Convention on the Protection and Promotion of the Diversity of Cultural Expressions. Preceding the last Compendium Assembly in Brussels, an informative exchange among ECURES members and the Board took place in December 2014. At this occasion, the re-launch of the ECURES website aimed at improving the visibility of our members and highlighting their research capacity was announced as well as strategic questions of how to improve (and finance!) future activities of ECURES discussed. The Assembly, held on December 12 and 13, 2013 at the Architekturzentrum in Vienna, reunited more Compendium colleagues and guests than ever before, since the first event took place in Strasbourg, 2002. In this context, an informal Open Meeting with Board Members of ECURES e.V. took place with 15 members. Main issues of the debates were the financial sustainability of the Compendium; new or ongoing ECURES activities that had previously been proposed by Board Members; and potential new calls for Contributing Experts of the Compendium. Later on that day, a reception provided the chance to toast on 15 years of Compendium collaboration as well as on the 20th anniversary of ECURES (and the 10th of the ERICarts Institute)! This event with the participation of Polish and European experts was held on 6-7 November 2013 in Warsaw (Poland) - see agenda. Initiated by the Polish National Centre for Culture and Wroclaw 2016 (European Capital of Culture), conference speakers discussed questions of definition ("Right to culture or cultural rights? "; "Right to access or right to participate? "); the "Right to Culture" in European comparison; the pros and cons of introducing a "Right to Culture" as a basic human right to the European legal system; and the draft of a legal guide on the "Right to Culture". ECURES members Kalliopi Chainoglou, Vesna Čopič, Bożena Gierat-Bieroń, Rui Gomes, Dorota Ilczuk, Ritva Mitchell, Andrew Ormston, Thomas Perrin and Andreas Wiesand took part in the debates. 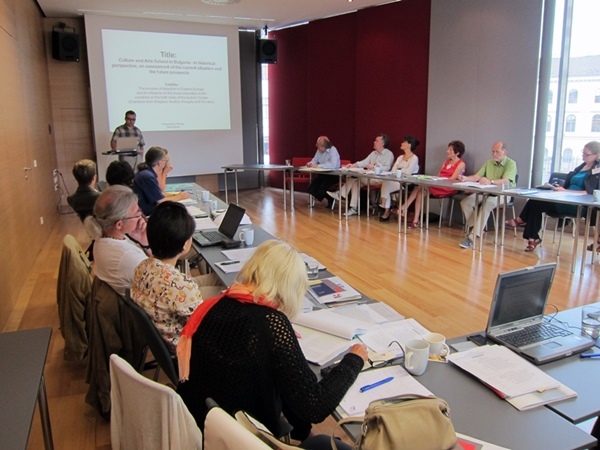 As proposed at the last ECURES Assembly 2012 in Helsinki, a first Young Scholars' Forum with over 30 participants was held on 13/14 August 2013 in Vienna and in Schloss Reichenau (Semmering). It has been organised in connection with isaScience at the International Summer Academy of the Vienna University of Music and Performing Arts and included the presentation of research topics and papers (mainly PhD theses) as well as panel debates addressing cultural policy challenges - with a focus on South-East Europe (see details here). In addition to Sanjin Dragojevic and Péter Inkei, ECURES Board members Vesna Čopič, Otto Hofecker and Elka Tschernokoshewa as well as Secretary General Andreas Wiesand participated as reviewers and panelists in the event.